Add a touch of elegance to your parties and dinners. Great hostess gift. Perfect for display. Glasses, bottle opener and wine bottle not included. Decorative metal wire frame with leaf embellishments. Place your favorite bottle of wine inside, hang up to 4 long stem wine glasses on the holders. Attractive design complements any decor. Perfect for dinners and parties. Great for everyday use and gatherings with friends, indoors and outdoors. If you have any questions about this product by Ideas In Life, contact us by completing and submitting the form below. If you are looking for a specif part number, please include it with your message. 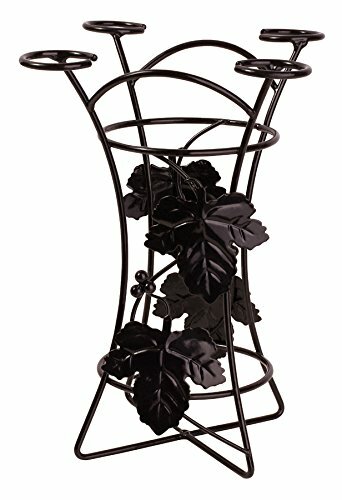 Superiore Livello Wine Glass Holder and Drying Rack. Perfect for Storage Your Stemware, Coffee Cup, Mug and Wine Glasses.